According to the SBA, a whopping 78 percent of businesses posted for sale during 2005–2014 did not sell. The primary cause for failure was lack of planning. Most business owners don’t realize that selling a business for maximum value typically starts one to three years prior to beginning the sale process. Owners who have diligently planned and prepared for the sale can increase the number of competitive offers and shave several months off the process since management has already address many of the key sticking points to completing a successful transaction. Not only does pre-exit planning increase the likelihood of a successful sale and accelerate the sale process, it also maximizes the value received at closing. The strategic initiatives undertaken in advance typically focus on increasing valuation drivers such as growth rate, customer mix, and EBITDA. This will enhance the quantity of prospective buyers, thereby driving a more competitive bidding environment and a higher valuation. The first step in pre-exit planning is the initial review of the business. Successful business owners understand that growth cannot be measured without benchmarks—in the case of pre-exit planning, the initial Business Valuation Assessment reveals the benchmarks, or Key Value Drivers (KVDs), that will have the highest impact on exit value. Businesses that are scalable and capable of functioning without the current owner are the most attractive to buyers. A strong management team and solid systems and protocols will help ensure a smooth transition—get these components into place and nurture them as early as possible. Also, be sure to, look at your business from an outsider’s perspective: non-performing operations and underperforming employees are value anchors that need to be cut. Once your KVDs are identified, develop a Readiness Action Plan (RAP) to address them. Be sure to include tracking metrics for each so that benchmarks can be reported and progress can be measured on a regular basis. The action plan is a living document—it doesn’t do you any good to leave it in a folder and forget about it. Set a quarterly review with key players or advisors (often these include an estate planner, wealth advisor, insurance broker, tax accountant, and/or attorney). Evaluate the company’s financials as well as the Readiness Action Plan (RAP) sheet listing progress on enhancers, detractors, and readiness. If there are any strategic roadblocks or issues, have in-depth discussions on how they can be addressed. A more in-depth assessment should occur on an annual basis. This is an ideal time to evaluate exit timing (which is frequently a moving target) and potential buyers. The type of buyer you target (direct competitor, industry-adjacent company, private equity group, etc) will frame the positioning of the sale. Most importantly, it’s an opportunity to assess the business’ (hopefully improved) position. What has positively affected value? What has negatively affected value? How will we address remaining gaps? What is the plan for the upcoming year? Building a company for a successful exit takes time and energy—but these efforts will be rewarded! According to PricewaterhouseCoopers, 65 percent of owners don’t know what their business is worth, even though 75 percent of an owner’s net worth is in their business. While executing on an action plan is vital, just knowing the worth of your business puts you leaps and bounds ahead of the majority of owners. 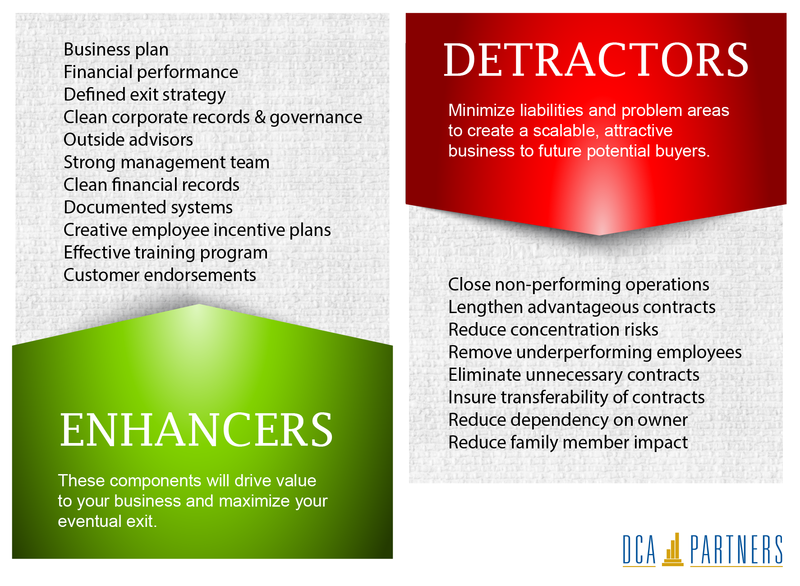 For more information on exit planning or selling your business, visit dcapartners.com or contact Justin Horner, Director, at jhorner@dcapartners.com or (916) 960-5350.